On November 12th, 2012, Maria Santos Gorrostieta, a former mayor of a small town in western Mexico who had survived two previous assassination attempts, was kidnapped in broad daylight, tortured, and killed. To anyone familiar with the situation in Mexico, this is just another horror story in the very long list of atrocities drug cartels have been perpetrating with increasing impunity for the past two decades. For author Christopher Irvin, the story served as inspiration to create a fictional account of the events leading up to Gorrostieta’s kidnapping that serves as a commentary on Mexico’s drug/political problem as well as a very entertaining novella. 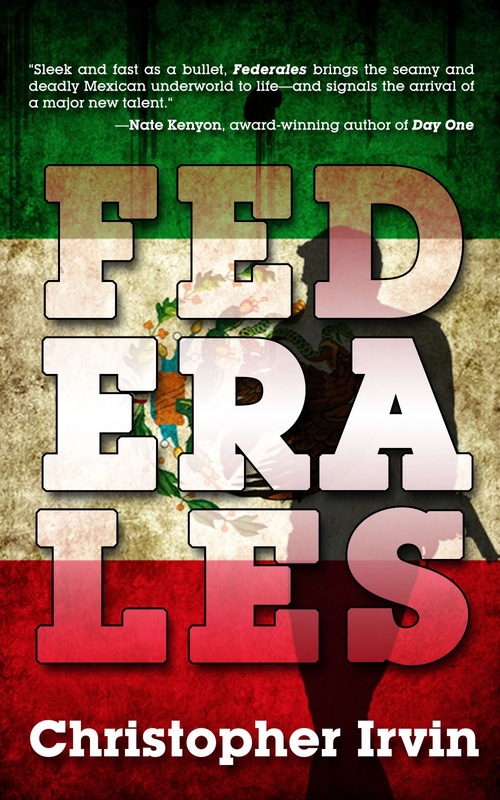 In Federales, Marcos Camarena is a Mexican Federal who has dedicated his life to the job while somehow remaining uncorrupted. Unfortunately, he might be the last clean agent in a country where drug cartels, politicians, and law enforcement agencies are basically one and the same. His stubbornness finally catches up to him and Marcos’s life is threatened. In order to evade certain death, he leaves law enforcement and his life in Mexico City behind and flees to a dilapidated shack his uncle owns in a coastal resort town. Marcos spends his time walking and drinking, but that peaceful existence ends abruptly when an old friend asks him to look after an outspoken politician, a woman in war with cartel violence: Gorrostieta. Marcos wants no part of that mess, but can’t bring himself to turn down the gig, and that puts him right in the middle of all the nasty violence and secret agendas. Irvin is an accomplished short story writer, and the frenetic pace of short fiction is a big part of what makes Federales a great read. There is no wasted space or extra words. Instead, the author delivers the story at breakneck speed and with no clutter. The result is a novella that can, and demands to, be read in a single sitting. The second element that makes Federales a recommended read is a combination of great characters and brutality that makes the narrative stick to your ribs long after the last page has been turned. Gorrostieta and Marcos are both caught in a battle they can’t win, but they somehow find the courage to keep fighting. Both of them want to do the right thing and are sickened by the current state of affairs, which is something much bigger than them. Their determination makes them shining lights in a world of awful darkness. By the time the end rolls around, the reader is already emotionally invested in these characters, and that makes the brutality hit that much harder. Federales is a fast, violent read. Irvin understands his subject and treats it with honesty and without an ounce of condescension. That mixture makes this one a hell of a debut novella and a very good start to the One Eye Press Single series.